In partnership with the Washington State Parks Clean Vessel Act program, WSG manages the popular Pumpout Washington program, which educates boaters about the importance of proper sewage disposal, informs them about where to find pumpout stations, helps marina operators secure grants to install more stations and advises on the deployment of mobile pumpout services on heavily used waters. In the past year, more than 8.3 million gallons that would previously have been dumped into vulnerable waterways were instead collected for safe onshore treatment, thanks largely to training, outreach and federal funds provided by the pumpout program. As part of the larger Clean Marina program, WSG conducts direct outreach to boaters, port districts and marinas through site visits, boat shows and other events statewide, with an emphasis on underserved areas with high concentrations of boaters. WSG trains boaters in how to use pumpout stations and distributes adapters that provide a secure connection between pumpout hose and boat holding tank. This eliminates a common source of sewage spills and reduces boaters’ reluctance to use pumpouts. To date, WSG staff have distributed more than 9,000 threaded fittings to recreational boaters, providing a clean and safe connection at pumpout stations around Washington. Learn more about how to write grants for your boating facility at an upcoming workshop. WSG helps Washington fishermen reduce risks with port-based, U.S. Coast Guard-certified training in emergency preparedness, fire response, cold-water rescue, first aid and other safety measures, using the latest equipment and procedures. Staff specialists also train recreational boaters in first aid and at-sea safety and survival. Since the mid-1990s, WSG safety training classes on Puget Sound, Washington’s outer coast and the Columbia River have markedly reduced fatalities in several fisheries. Topics covered in First Aid at Sea courses include patient assessment, hypothermia, cold water, near-drowning, shock, trauma, burns, fractures, choking, immobilization and important contents for first aid kits. WSG experts also train commercial fishermen and charter boat operators in how to conduct safety drills at sea. These courses meet the training requirements of the Commercial Fishing Safety Act. The course work combines lectures and hands-on experience with the safety and survival equipment required on commercial fishing vessels. Fishermen and boaters learn about emergency procedures and develop appropriate drills for their own vessels. Vessel operational systems and technology change constantly. Many commercial and recreational boaters rely on education programs to keep up with the changes in technology and equipment on their vessels. WSG offers classes and workshops on vessel safety, maintenance and operations, covering marine refrigeration, corrosion protection, diesel engine troubleshooting, computers, navigation and other topics of concern to Washington vessel owners and operators. Workshops are geared to commercial fishermen, but recreational boaters and others with close ties to the marine environment are invited to participate. Small oil spills from commercial and recreational vessels often result from a lack of knowledge about proper techniques for vessel operation and maintenance. To address this problem, WSG works with state and regional partners to determine the most common causes of spills based on reported incidents. WSG staff educates vessel owners and marina owners, helping them improve their operations, reducing spills due to targeted causes. At the same time, WSG promotes spill reporting through the “Spills Aren’t Slick” campaign; with support from the Pacific Oil Spill Prevention Education Team (POSPET, a Canadian oil spill task force), WSG provides signs and educational brochures. The small oil spills program is an important aspect of the larger Washington Clean Marina program. In an ongoing partnership with this program, WSG reviews and updates boating facility best management practices and inspects and certifies clean marinas. WSG incorporates oil spill prevention into classes and workshops for commercial fishermen and actively distributes spill cleanup kits at marinas, boat shows and boating venues. WSG produced in partnership with Puget Soundkeeper and the Washington Department of Ecology, a comprehensive handbook, Pollution Prevention for Washington State Marinas. This 72-page, full-color, interactive handbook provides a comprehensive guide for marina managers and staff, as well as boaters, to reduce water pollution from their facilities. The marina industry and state marine recreation agencies and consultants need accurate, geographically-specific recreational boat fleet information to respond to changing vessel moorage and sanitation needs. Boat dealers and yacht brokers need similar, timely information about the characteristics of vessels that are sold in order to adjust business plans and inventories. WSG offers a unique service to Washington’s boating industries and government marine recreation agencies by providing an annual fleet summary and quarterly sales reports not available anywhere else. The data include fleet size, value, age and geographic distribution across the state, and vessel characteristics, such as hull materials, boat types and length classes. In addition, sales are tabulated in units sold and dollar value. 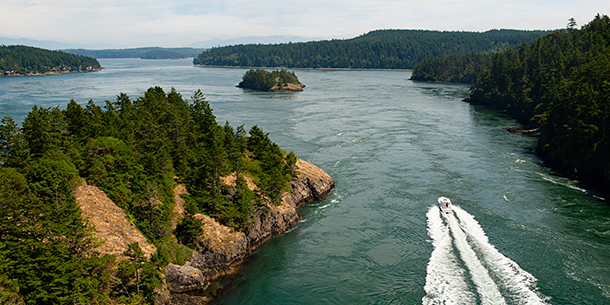 Washington Sea Grant provides this service by analyzing weekly boat sales and annual fleet characteristics derived from Washington Department of Licensing raw titling and registration data. The boat sales reports and annual fleet summary are posted on the WSG website and shared with the Northwest Marine Trade Association.